Well, it's official. My shop is up and running. I still have some things to finish and some items that I need to list, but at least the bulk of it is done. I will be adding to the store as I finish projects. Since my shop is now open and this is my 200th post, I am going to do a giveaway. 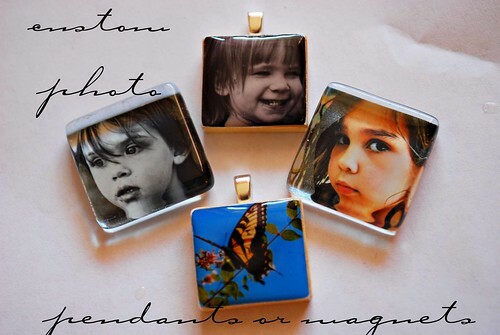 I am going to give away a custom photo scrabble tile or glass tile pendant or magnet (your choice) to the lucky winner. To enter all you have to do is leave a comment. If you want to increase your chances, post a little something on your blog letting people know about my shop and I will count it as 5 entries. The dealine for entry is Tuesday November 25th. The winner will just have to e-mail me a digital photo of their choice. It doesn't have to be of your child either. See that pretty butterfly one below. Thanks everyone for the nice and supportive comments that you have left for me. Hey can I be eligible for this giveaway? Awesome! I'm so happy for you that you're doing this. I hope that your etsy shop prospers and you find great joy in the projects you work on. BTW, I am SO totally writing a shout out for you on my blog!!! I want those 5 extra entries ;) I love your stuff Jen! Your work rocks! I love it! I would buy your pendants but I don't wear necklaces, any earrings in your future? Or bracelets? But I may just have to buy Christmas gifts. I was going to put a shout out on my blog for your etsy shop anyway but I would love to take the 5 extra entries too! Eeee! So excited for you. It looks awesome, and all your stuff is beautiful. I know you'll be a success. But I think you should more emphasis on the fact that everything is all recycled and green! That can be a selling point. All of the things in your shop are beautiful! Great job! You are so talented and creative. I hope that you do well in your shop. What a great accomplishment -- congratulations on getting your shop up and running! And I want to enter too...you make such awesome stuff! Congratulations Jen! How exciting. I think it is really going to work out well for you! these are really great! i love that you are using old scrabble tiles to make necklaces. what a fabulous idea! and the little owls- too cute! Wordless Wednesday- What Do You See?